These are volatile times for the financial markets, thanks to chaotic global events and uncertain domestic events linked to interest rates and standstill government policy. This makes it imperative for you to tread cautiously—in choosing stocks and also the sectors to which the stocks belong. A look at the year-to-date returns show that among the 30 stocks of the Sensex, some have declined 40% and others, despite the sharp correction recently, have returned in excess of 10%. In other words, there are disappointments as well as opportunities in the market. Says Nikhil Vora, managing director, IDFC Securities Ltd, “There is earnings visibility in India for some time to come. At least 40% of the companies are trading at a value less than the capital employed, signifying great value." To begin with, let’s understand where the uncertainty is coming from. Global uncertainty: There are significant concerns looming over global financial markets and economic outlook. Though it’s unlikely there will be much effect on India’s exports, capital flows may be hit. Any contraction of global liquidity will be bad for India’s financial markets as well. Many Indian firms access overseas funds and that could be affected if global liquidity dries up. During a debate at a recent Mint Money conclave, Ridham Desai, managing director and head (research), Morgan Stanley, India, said, “The only risk factor in the near term is capital flows. If this morphs into a financial crisis of sorts as in 2008, access to capital may get difficult." Domestic factors: Then there are domestic factors, including persistent high inflation and pending reforms, to contend with. Says Vora, “When we talk of a global recession we are saying, in the West, growth will drop 60-70%. But in India the impact will be 10%, that too because of absence of reforms and high rates." In all likelihood, inflation will be lower next year on account of a base effect and the effect of 12 successive rate hikes in the last 18 months. Thus, many believe that interest rates should peak out over the next three-six months. On 16 September while hiking policy rates one more time, the Reserve Bank of India (RBI) said in a press release: “To sum up, developments in the global economy over the past few weeks are a matter of serious concern…. Going forward, the stance will be influenced by signs of downward movement in the inflation trajectory, to which the moderation in demand is expected to contribute, and the implications of global developments." There has been continued government inaction on many policy agendas such as foreign direct investment and infrastructure-linked spending, but that may change next year. For example, last week the government cleared the Delhi-Mumbai industrial corridor, an infrastructure corridor worth ₹ 18,000 crore, and expanded the overseas borrowing limit through the automatic route to $750 million ( ₹ 3,584.25 crore). For a recent report on India Strategy, Nikhil Vora, MD and Kavitha Rajan, analyst, IDFC Securities, met 16 ministries and gauged a sense of urgency. They expect the government to kick-start the reforms agenda. Banking: While there isn’t a consensus on exactly when RBI would stop raising rates, the buzz is it will be sooner than later. Most experts feel that inflation will look lower by December this year and by next fiscal the tightening would have surely stopped. Says Ajay Parmar, head (research), Emkay Global Financial Services Ltd, “Higher interest rates are detrimental, but we expect one or two more hikes of 25 basis points (bps) each and a pause thereafter." The latest 25-bps rate hike was expected and didn’t cause a flutter as such. The banking index has corrected 11.65% since August and a number of banking stocks are now available at a value less than one time their book value. This is an attractive price to pay for a business that, despite the current roadblocks, is expected to grow significantly over the next decade. Moreover, if the fears on global growth play out, then RBI may even start considering monetary easing in the next financial year. Credit growth, albeit slowing, is still in the range of 18% and bank margins so far haven’t suffered significantly as they have been able to pass on costs to borrowers in the form of higher lending rates. One fear is that with high interest rates, there is a danger of increase in non-performing assets if borrowers are unable to repay. But its still not reality. At this juncture, the bad news for the banking sector could be peaking out and analysts say that the turn of events is not far. This sector should deliver good returns going forward. Says Vaibhav Agarwal, head (research), Angel Broking Ltd, “Interest rate sensitive sectors will continue to see good growth; large banks are a good investment today. For smaller banks it’s better to wait once rates move lower." A word of caution by some experts: select stocks whose advances book has a lower small and medium enterprise (SME) exposure. Infrastructure: This is another sector where many experts are willing to take a leap of faith. They especially prefer stocks which will be positively affected with the impending government policy action as mentioned earlier in the story. However, stocks in this space have surprised on the downside, making the uncertainty on future earnings glaring. According to Anand Shah, chief investment officer, BNP Paribas Asset Management India Pvt. Ltd, “Concentrate on picking asset owners as cost of setting up is high and companies which own assets will trade at a premium." Overall, experts agree that this sector will be the biggest gainer from the government policy action. If that gets going, the prevailing global uncertainty won’t have a material effect on future growth of the infrastructure sector. Consumption: Most experts are certain that growth momentum will continue in the domestic consumption-linked sector. Says Gaurang Shah, assistant vice-president, Geojit BNP Paribas Securities Ltd, “In the consumption sector, earnings momentum will continue. Even though there may be some input cost pressures, future earnings and growth visibility is high." Undoubtedly, the increasing cost of raw material is affecting profit margins, but revenue growth continues well owing to volume expansion. The consumer goods industry is essentially a cash generating business and that’s why investors tend to buy these stocks in times of uncertainty. Moreover, in India, with a growing young, working age population, consumption is perennial. The caveat is that a number of these stocks are currently trading at very high valuations and even though the companies will continue to deliver earnings growth, buying at lower prices may be more sensible. As Desai said at the Mint Money conclave, “Consumer products are very expensive and experience shows that if you buy expensive stocks regardless of fundamentals, you don’t make returns." Others: There are other sectors, including pharmaceuticals, agriculture-linked goods and services, domestic commodities, automobiles and gas distribution, where experts are selectively positive. In most of the above segments, the choice of stocks is limited. One way to tackle volatility is to stick to an asset allocation. As mentioned above, foray into direct equity only if you have the wherewithal. Direct equity: Choose industry leaders or large-cap stocks as they have corrected significantly and are available at a good valuation. Also, these stocks are best placed to take advantage of growth opportunities in the industry. Says Shah of BNP Paribas, “National GDP growth should continue at 15%, this will reflect in business growth too. Large companies will deliver better risk-adjusted returns; it’s prudent to look at large-cap-oriented funds." 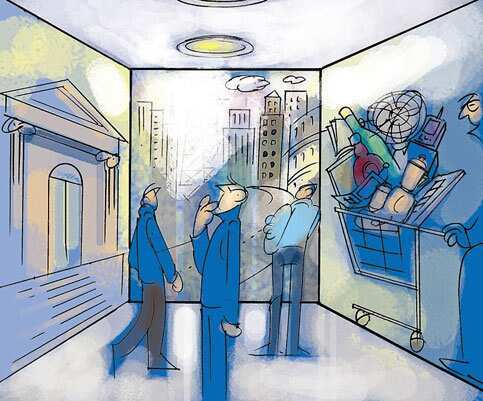 Mutual funds: There are funds specific to banking, infrastructure and consumer industry sectors. Be mindful that investing in sector funds is risky. You can use sector funds to complement your existing equity portfolio, only if you are willing to take the risk. Sector-specific funds shouldn’t be more than 20-25% of your funds portfolio. Sector views can change swiftly, so avoid systematic investment plans. Word of caution: Remember that there are risks on the global economic front and interest rate and execution (government policy) risk on the domestic front. This means a straightforward rally after the recent correction is unlikely. Also, it’s best to follow the thumb rule: equities give best returns in the long term. So stick to large-caps for the long term and have a staggered approach to investing.